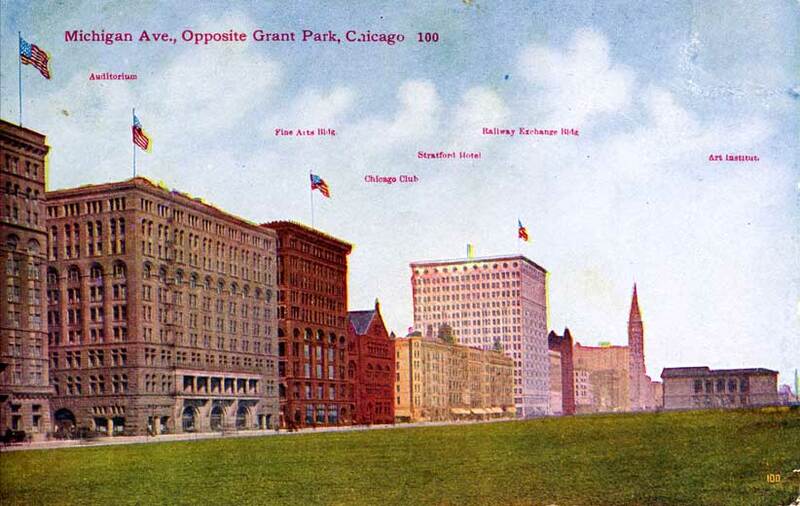 This postcard shows the buildings along Michigan Avenue opposite Grant Park, looking north. The card is postally unused, but has a divided back. Space for written messages on the stamp side of a card was first allowed by the post office on March 1, 1907. The blurb on the back of the card states, "100. MICHIGAN AVENUE, OPPOSITE GRANT PARK.--This thoroughfare is one of the principal boulevards of the city, being a connecting link with the other numerous boulevards and parks. On this boulevard is located great Art Museum, Auditorium Hotel and other magnificent structures. Grant Park at the present is in course of construction, but when completed will be one of the finest parks and pleasure grounds in the world. In this park will also be located the magnificent Field's Museum." [italics added]. The Field Museum of Natural History was built in 1912, so we can place this image into the years of 1907-1911. From analysis of the detail view (next image), we can narrow the timeframe further to the years 1907-1909. We can also note that Grant Park is a tree-less expanse of grass in this view--no east-west streets extend east of Michigan Avenue into the park. In this period, Jackson and Michigan formed a "T" intersection. 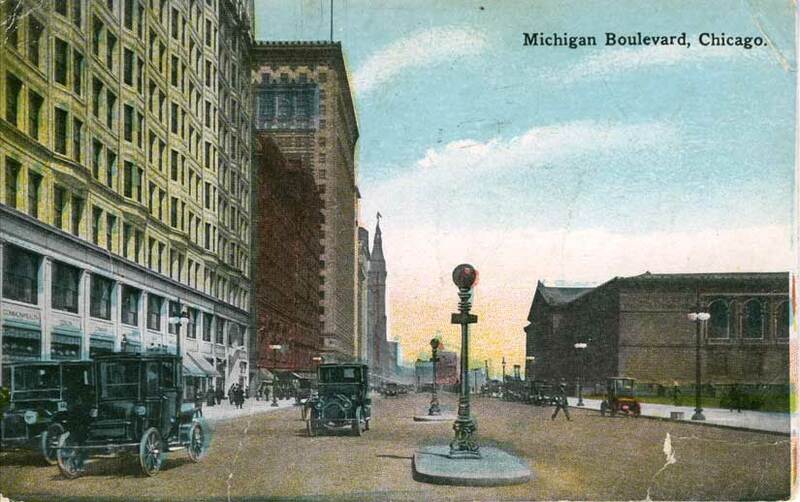 Detail view of the above postcard shows the principal buildings at the "route center" intersection of Jackson and Michigan Boulevards. The legend at the top of the view informs us that the building at the lower left is the Stratford Hotel. To the right of the Stratford is the Railway Exchange. Jackson ran west from Michigan between these two buildings. In this view, the Stratford Hotel seems to fill the entire block along Michigan Boulevard from Jackson south to Van Buren, but in fact this block contains three buildings of similar height and facade. 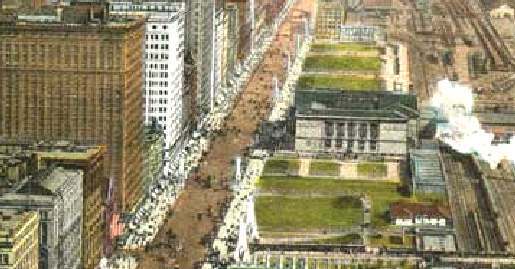 In 1910, the McCormick Building replaced the southern structure in this view, so this image depicts the period of 1904, when the Railway Exchange was built, through 1909. East of the intersection lies Grant Park, with the Art Institute to the northeast of the Jackson Boulevard terminus. The configuration of the route center intersection would remain largely unchanged until the Stratford Hotel is razed in 1922. "MICHIGAN BOULEVARD, LOOKING NORTH, SEEN FROM AEROPLANE, CHICAGO." Published by the Max Rigot Selling Co., Chicago. 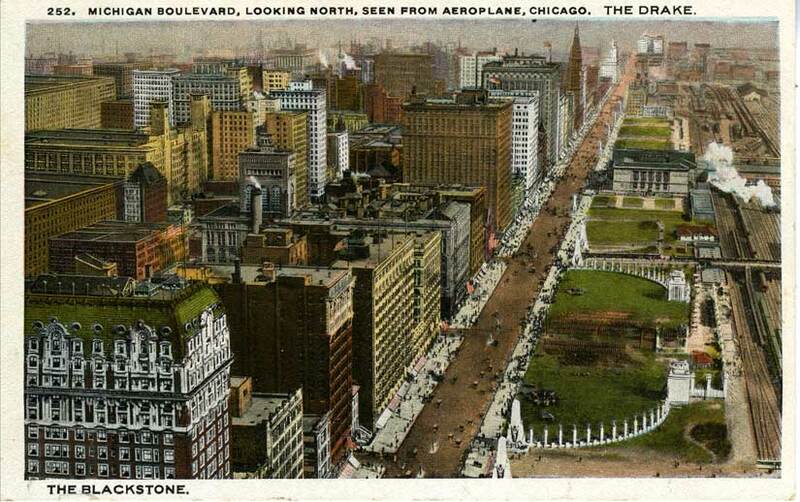 From the reverse of this divided-back postcard: "This picture gives a full view of Michigan Avenue. Nowhere in Chicago is there such a row of beautiful and magnificent buildings as shown on the reverse side. Prominent buldings are the Blacktsone Hotel, Harvester Bulding, Congress Hotel, Auditorium, Pullman Building, Peoples Gas Building, University Club, Tower Building, Peoples Trust and Savings Bank Building and the Drake." The Drake Hotel was built in 1920, and the Stratford still stands on the southwest corner of Jackson and Michigan (demolished in 1922), so we can date this image to 1920-1922. Notable improvements in Grant Park have been made since the 1907-1909 era, but still no streets are extended east of Michigan Avenue into the park. Detail view of the 1920-1922 aerial postcard. Midground to the right of Michigan Boulevard is the Art Institute. The white building across Michigan from the Art Institute is the Railway Exchange, and to the south is the Stratford Hotel. Closer to the foreground we see that the high-rise McCormick Building dominates the south end of the same block as the Stratford. The green space south of the Art Institute shows a rectangular pattern of walkways. The Fountain of the Great Lakes would have been installed by this time, facing south along the south wall of the Institute (in front of the center of the five tall windows). These walkways would provide pedestrian access to the fountain. Divided back, postally used card, postmarked August 15, 1916. View looking north from the "route center" intersection of Jackson and Michigan. 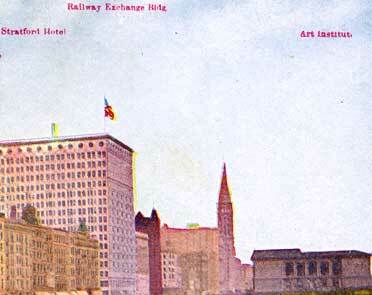 The Railway Exchange is in the left foreground; to its north are the Pullman and Peoples Gas Buildings. The Art Institute is to the right. An early divided-back postcard that provided writing space on the left side of the back of the card, as well as the bottom of the front (below the image). Space for written messages on the stamp side of a card was first allowed by the post office on March 1, 1907, so this card is likely from that period (it is postally unused). The image on the card is of the 1904 Railway Exchange Building, which still occupies the northwest corner of Jackson and Michigan. 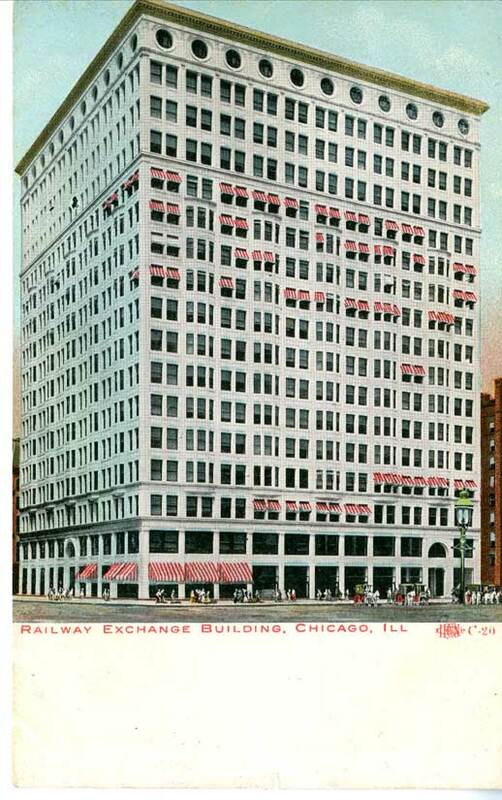 Built by the D.H. Burnham and Company architectual firm, it was designed to house the offices of the many railroad firms that called Chicago home. This undivided-back postcard has space for written messages on the image side only, so this postally unused card most likely dates from 1901-1907. 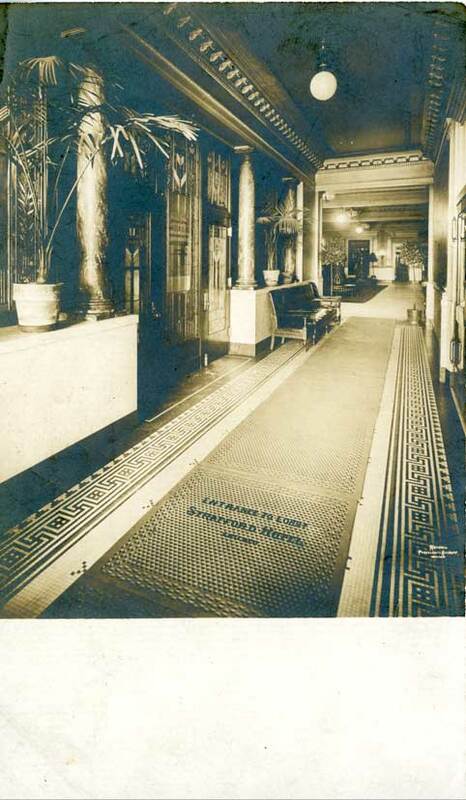 The image is of the entryway to the Stratford Hotel, located at the southwest corner of Jackson and Michigan from 1872-1922. The building was six stories tall, and had been known as the Gardner House and the Leland Hotel before being named the Stratford. 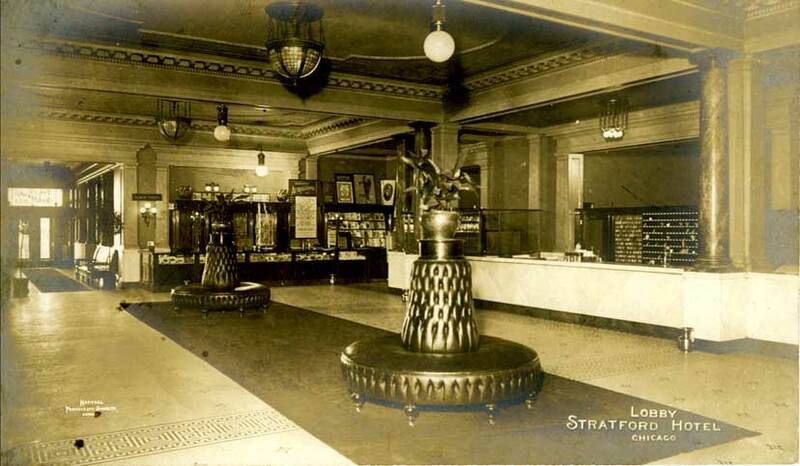 Another view of the Stratford Hotel lobby. This card has a divided back, so most likely dates from 1907-1915. 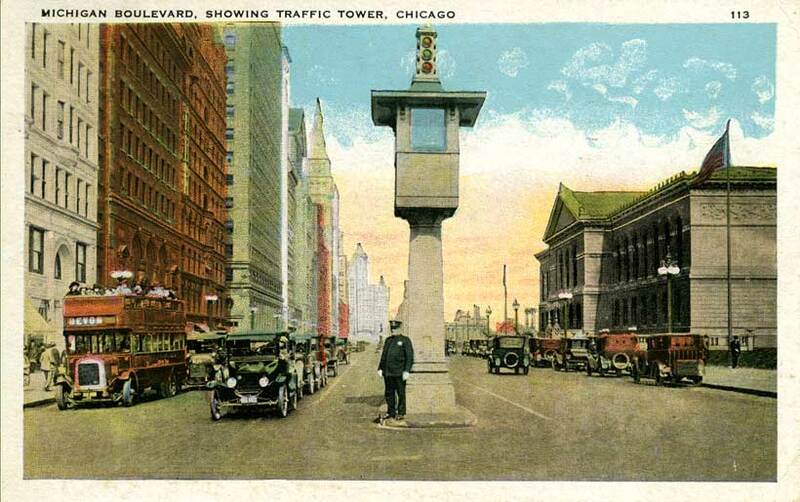 The architect of the Stratford was W.W. Boyington, who designed the Chicago Water Tower on North Michigan Avenue. He also designed the Grand Pacific Hotel and the 1885-1929 Chicago Board of Trade Building, both located at the intersection of LaSalle and Jackson in the Route 66 corridor (although the Grand Pacific Hotel, like the Stratford, would be razed before the U.S. Highways were commissioned in November 1926). Close-up view of the Fountain of the Great Lakes, located along the south wall of the Art Institute. In the 1920s the fountain was clearly visible from the "route center" intersection. The blurb on the divided back of the card states, "This beautiful fountain by Lorado Taft world-famous sculptor, adjoins the Art Institute to the south in Grant Park. A Benjamin Ferguson Memorial." The fountain was installed in 1913, the first major sculpture for Taft in his home town of Chicago. 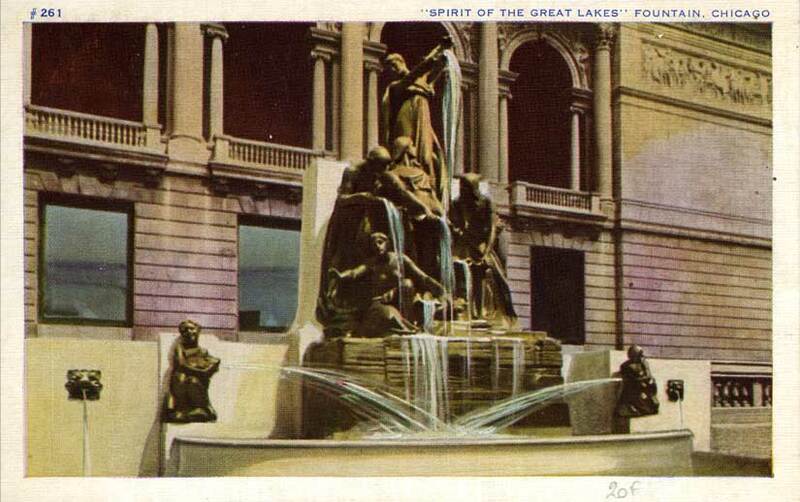 The five female figures represent the five Great Lakes, and the water in the fountain flows from the figures representing Superior and Michigan near the top, to Huron, Erie, and Ontario. The fountain remained in its original placement until 1963, when it was moved next to the new Morton Wing addition to the Art Institute, facing west instead of the original south-facing orientation.